More than half a century after the Improvisation opened its first comedy club in NYC and became the best place to catch sets by Richard Pryor, Billy Crystal and Jerry Seinfeld in their prime, the Ontario Improv carries on the legacy as one of the greatest venues for rising comedy stars in the Inland Empire. Founded in 2001, the Ontario Improv showcases nationally touring headliners alongside tomorrow’s next big acts. Few comedy clubs are as universally known and respected as the Improv, and surprisingly little has changed as the Improv brand has spread to cities across the country. Just a mic stand, a spotlight and that iconic brick wall — and a host of talented comics making people laugh nightly. This venue requires a two-item minimum purchase per person. For Friday and Saturday shows, you must be age 21 or older to attend. For Sunday through Thursday shows, you must be age 18 or older to attend. The weather was rainy and abit windy. I wore Black slacks with a very cute shimmery top, nice flat shoes. Upscale casual. .
Be sure to arrive early. The parking at the Ontario Improv on a Friday night is a zoo. I suggest you arrive 1 hour early to get a good seat. 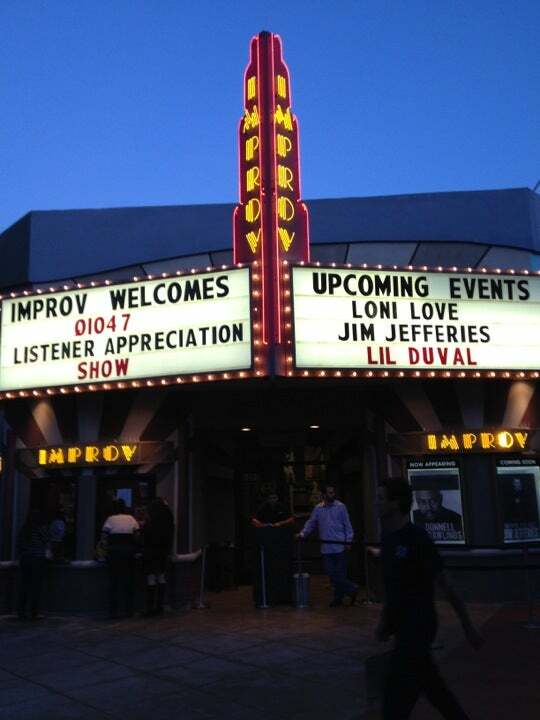 Get to the Improv early for headlining acts. The shows fill up quick and you'll end up with less desirable seats. Recomed the valet parking only $8 right in front of the Improv. There is a 2 item minimum per person.